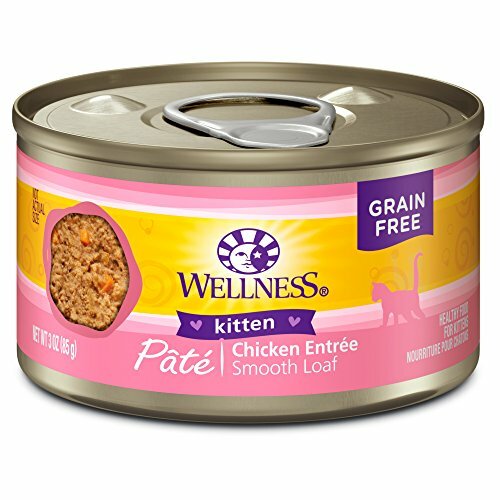 Wellness Complete Health Natural Grain Free Wet Canned Cat Food, Kitten Recipe is a healthy, natural cat food for kittens with excellent sources of protein and essential fatty acids for complete and balanced nutrition. This special kitten food recipe is made with high quality proteins, are free of added growth hormones and steroids and also include other key ingredients like sweet potatoes and carrots, essential vitamins and minerals, and fresh, whole cranberries and blueberries which are added to help maintain proper urinary tract health. In addition, hydration is extremely important to a cat’s overall health and since cats do not have a strong thirst drive, Wellness Complete Health wet canned cat food recipes are a delicious and healthy way to increase your cat’s moisture intake.